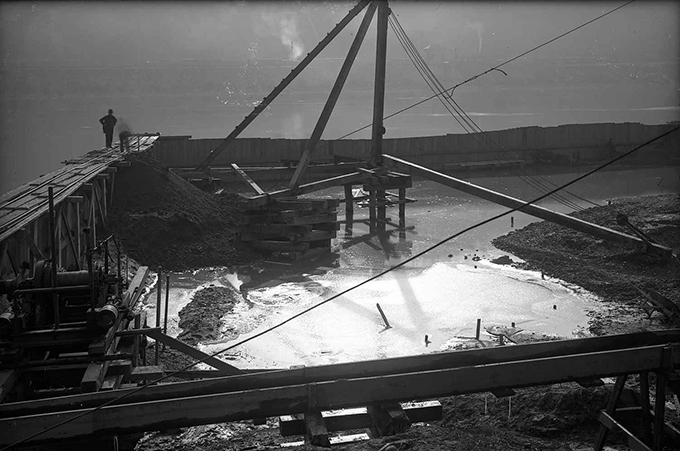 View showing a man on the edge of the cofferdam, looking south with the Allegheny River in the background. A cofferdam is a temporary structure created to expose areas that are normally underwater so that work, such as creating supports or repairs can be completed. Waterworks--Pennsylvania--Pittsburgh--Design and construction. ; Blue collar workers--Pennsylvania--Pittsburgh. ; Cofferdams--Pennsylvania--Pittsburgh--Design and construction. ; Allegheny River (Pa. and N.Y.). ; Rivers--Pennsylvania--Pittsburgh. ; Lincoln-Lemington-Belmar (Pittsburgh, Pa.).